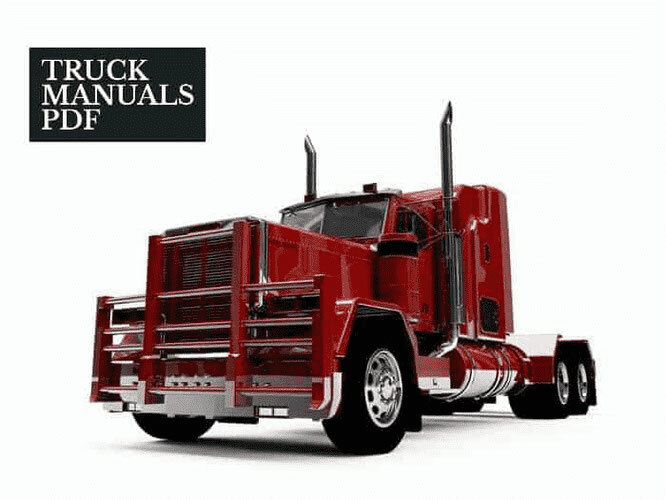 Some of UAZ Trucks Manuals PDF shown above. In July 1941, Goverment of the USSR decided that Moscow must evacuate large enterprises. At the same time, it was decided that the assembly plant VMS should open in Ulyanovsk. In October 1941, employees of the VMS with the equipment was evacuated to Ulyanovsk. Production was deployed accelerated pace. Already in the beginning of 1942 was released the first products. The shop started manufacturing aircraft ammunition shells. By early May 1942, the plant produced the first five ZIS-5. In February this year, the plant began assembling cars bench for the army. By July, the month increased rate of assembly. On the assembly line has gone down to 30 cars per day. At this time UlZIS (Ulyanovsk Branch №4 VMS) officially becomes the parent company for the production of ZIS-5. On the front were sent dozens of trucks. In autumn 1942 the plant began production of small-displacement engine P3 / 2 for the army. At year end, the company employed about 4,000 people already. June 22, 1943, it was decided - to build a car plant in Ulyanovsk. As for industrial and residential construction has been allocated 200 hectares of land across the river Sviyaga. Subsequently, there has grown one of the largest areas of the city. At the beginning of May 1943 the factory was made the first prototype truck UlZIS-253, operating on diesel fuel. It was his first automobile produced by the plant. According to its dynamic qualities and economic indicators, it was not inferior to famous American "Studebaker". Specialists highly appreciated car. In late 1944, the production of ZIS-5 was transferred to the Urals in the city of Miass. Ulyanovsk plant began to develop and establish production of cars GAZ-AA The first such truck was released October 26, 1947. March 13, 1949 the plant has produced ten thousandth truck. At this time, for two shifts were produced by 140 cars. On festive demonstration November 7, 1947 was the prototype monochrome truck UAZ-300. In 1950, road tests have been conducted that truck proudly stood. But the production of this truck and has not begun. In 1954 the factory was organized by OGC (Office of the Chief Designer). At first it was quite a small group, led by IA Davydov. The group took the documentation from the gas, after the acquisition and processing of transfer it in the technology department. When the plant came new specialists started the development of new cars UAZ. By the end of the year were manufactured commissioning party GAZ-69. In 1955, an order was issued Minister. According to this order UAZ had to master the production of passenger cars with high cross GAZ-69 and GAZ-69A, as well as trailers. Since that time, specialization UAZ was the production of light-duty vehicles, but with a high cross. In 1955 the plant was charged - as soon as possible to carry out the development of several types of vehicles, including vans, trucks, sanitation trucks and a van. The overall layout of vehicles was changed. Cabin began to place on the engine. Until that time, this arrangement for vehicles with high cross did not use one in the world. This will significantly increase the volume of the body without changing the length of the car. In 1956, UAZ cars began to arrive for export. Already in 1959 the production of all-terrain vehicles UAZ appeared in 22 countries. UAZ appreciated worldwide. They were very reliable and easy to operate. Driving characteristics were better than those of similar models of foreign manufacture. UAZ vehicles earned respect around the world. In 1960, a group of designers UAZ has been issued a certificate of authorship of the invention of a new step of the conveyor. The invention proved to be very effective. In early 1961 it was decided to develop and produce new brands of cars. At the end of the year went to a series of van UAZ-451 truck and UAZ-451D with Flatbed. With the new first cars came off the assembly line 12 December 1961. And in our time, the plant produces modifications to these vehicles. In early 1965, the plant celebrated the production of the 250,000th car. It was a GAZ-69. In the same year completed development of passenger car UAZ-69, which was to change the GAZ-69. Designer very carefully worked suspension bridges and a cabin. After that passed control tests. After their successful completion of documentation on the car was handed over to the department of pre-production. In May 1966, in Moscow, an exhibition of agricultural machinery. It was attended by representatives from twenty countries around the world. Truck UAZ-452D in this exhibition was awarded a gold medal. The car was very unpretentious, had greater maneuverability and good permeability. In rural areas, it has become simply irreplaceable. August 20, 1966, the Soviet government awarded UAZ Order of Red Banner of Labor. In January 1967 the plant received terms of reference approved by the USSR State Planning Committee and the Ministry of the automotive industry. According to this it was necessary to carry out the instructions of the expansion and renovation of the company. Planned release of new models and increased production by 3.5 times. November 2, 1971 the factory was held a technical council. It was decided that the proceedings should be translated into non-stop with the car GAZ-69 and GAZ-69A on the UAZ-469 and UAZ-469B. In 1972, the government had successfully test UAZ-469. In the same year was launched freight line and completed the expansion of the main conveyor. Commissioning party UAZ-69 was released on December 15, 1972. February 18, 1974 was one-millionth car factory - UAZ-452 (van). By the time this car has become very popular. Three of these cars in August 1974 rose by serpentine road to Mount Elbrus to a height of nearly 4,000 meters above sea level. Managed to overcome this height in just 38 minutes. February 16, 1976 the plant received a government award - the second Order of the Red Banner. 27 December of the same year the engine UAZ-451M was assigned Quality Mark. In November 1977, was awarded the Quality Mark UAZ-452 (van). In 1983, a group of designers of the plant was awarded government awards for his invention of the car "Jaguar", able to swim. This car was designed for the army. Around the world still do not have this car unique. It can develop in the water speeds up to 10 kilometers per hour. In 1989, organizers of the television program "travel club" UAZ invite a representative to take part in the production of cars UAZ part in the expedition of the international project "The Great Silk Road". This expedition was conducted under the auspices of UNESCO. Factory workers agreed to participate. Was completed about 10 000 kilometers along the sands and mountains of Kazakhstan and Central Asia. As for the cross, and speed UAZ vehicles will not yield the world famous company "Mercedes-Benz. On the same mountain climbs ku our car was an advantage. In 1992, UAZ was reorganized and given the name of "UAZ". In 1993, the plant began producing cars UAZ-31514. This was a modification of the UAZ-469. It differs from its predecessor in that it had installed new door locks, adjustable seats and a metal roof. In addition, a provision for mounting a spring front suspension and a more efficient engine. In October 1994, the plant received the international prize "Golden Globe". So commented on the high quality and competitiveness of enterprise, as well as outstanding contributions to the development of industry in the country and integration into the economy of the world. In 1996 the plant item sales volume was awarded the European prize "Golden Mercury". In 1997, at the International Fair "Europe - Asia - Transit" in Yekaterinburg UAZ-3160 was awarded a diploma and a small gold medal. In the same year the plant was organized PAMS - car production in small batches. The first model, which has mastered this production was the UAZ-3153. In contrast to the UAZ-31514 he had long base. August 5, 1997 was released the first experimental batch of UAZ-3160. This car was the basis of the models 3163 and UAZ-Simbir. In June 1998, the plant began production of UAZ-31604 with the engine on diesel fuel. In the future, was the emergence of a number of vehicles based on the new truck chassis - a new version of the car for fesmerov, truck and modern buses. September 14, 1999 was released thousandth UAZ-3160. The first UAZ-3162 was released April 27, 2000. October 12, 2000 JSC "Severstal" has acquired a large stake in the company. At the same time, was finalized a van "Multiven." It can carry up to 12 people. In sentyabrke 2001 in Moscow took place VII Industrial Exhibition - Fair. Car UAZ Simbir got there the gold medal. Experienced model UAZ-2362 pickup, minivan UAZ-3165 and many others have been demonstrated during avirprobega "Ulyanovsk - Zavolzhe - Cherepovets - Ulyanovsk". In 2001, in accordance with the Program for the development of a dealer network of "UAZ" in 2001, the company has formed a network of sellers from more than 100 organizations, both in Russia and in neighboring countries. In August 2002, it was noted thirtieth freight line of the main conveyor. 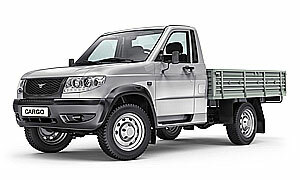 Then pick UAZ-23632 at the VII International Auto Russian diploma awarded the "Grand Prix" and "recognizes the best pick-up» MIMS-2002 "
In March 2003, the company opened the assembly plant in Vietnam. Car UAZ Simbir March 26 of that year became one of the winners of the national program-competition "Hundred best goods of Russia". He received the right for two years to wear a silver badge. In Shanghai, the international exhibition in April 2003, has been demonstrated UAZ Simbir on which you installed the engine ZMZ-409. In the same year on November 20 was released last UAZ-31512, which was a modification of the UAZ-469. Was soon released the first UAZ Hunter. Back in 2003, assembly and production company bodybuilder has been certified for compliance with the company's management system requirements of ISO 9001: 2000. The certificate was awarded to the company January 16, 2004 representatives of the German company «TUV Management Service." 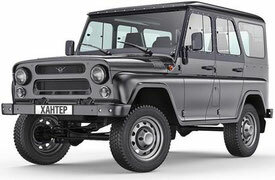 March 4, 2004 was released the first truck on the basis of 3160 - UAZ-2360. In the same year, from April 17 to May 30 rally was held UAZ-2360, Simbir and UAZ Hunter from Krasnoyarsk to St Petersburg. On the way in most major cities conducted test drives new cars under the motto "All Terrain Output" competition and SUVs. August 17, 2005 began serial production of UAZ Patriot. It was the first fundamentally new, comfortable and modern SUV. This car was designed for those who lead an active lifestyle. It is possible to go on holiday now on the nature or go shopping for the whole family and a job. In this model, were used all the best technical solutions that have been developed at the plant during the whole of its existence. Very many solutions and components were taken from the famous car manufacturers. In the car was used by more than 20% of imported components. In order to release the car factory was built a new set of color Eisenmann, the modernization of the main assembly line and launched a new welding line.